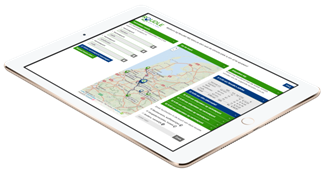 The newly launched meeting location planner Roudle helps to reduce travel time as well as CO2 emission. This week Roudle.com has been launched. This new website determines the optimum meeting point for getting together with people from multiple locations, with minimal total travel time. Even in a world where meeting online is becoming more and more used, it is valuable to meet in person now and then. Whether for business, such a following a training course, or for private meetings, the question ‘where to meet?’ often remains difficult to answer. Meeting in the wrong location can cause unnecessary travel time and travel costs, as well as get you stuck in a traffic jam and thereby causing unnecessary CO2 emission and other negative environmental impacts. Roudle is a new Dutch start-up company that solves this problem: Enter the multiple locations of the travellers on Roudle.com and Roudle will show you the optimum meeting point (or more if they are of equal quality), based on actual travel times and distances and expected traffic congestion at the desired moment. The advise Roudle provides often surprises; your intuition often sends you in the wrong direction. Roudle works in a simple way: The user chooses two to six starting locations. By using extensive traffic data and smart algorithms, within half a minute, the user is presented with the objectively best solution, not influenced by any sponsor or advertiser. Subsequently, Roudle assists in finding a suitable restaurant, hotel, or shared office in the vicinity of the optimal meeting point. A simple click is all you need to share the information with the other travellers and plan your meeting. Roudle was invented and build by a small team led by Christiaan Rasch and Thijs Brentjens. A few months ago they won the Smart Mobility Challenge of the province of Utrecht and with this price they have build Roudle. Together with the rest of the team, they will continue to evolve Roudle by adding various functionalities and possibilities, and expanding its availability throughout Europe and beyond. More information in English can be found at www.roudle.com/en. The planning service is freely available at www.roudle.com. At this moment we only support the Dutch Language. Note for editors (not for publication): For more information you can contact Christiaan Rasch at christiaan@roudle.com.